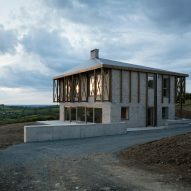 The palette of exposed, untreated materials used to construct this house in Killan, Ireland, results in a building with an intentionally unfinished appearance. Killan Farmhouse is located on a hill on the client's farm in County Cavan. 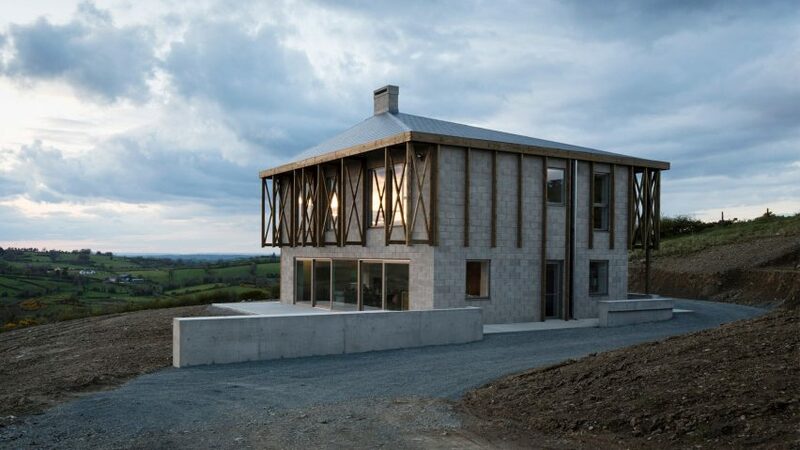 Dublin-based TOB Architect, founded in 2013 by Thomas O'Brien, designed it as a practical and affordable family home. O'Brien was heavily influenced by the Casino at Marino – a neo-classical building designed by Scottish architect William Chambers for James Caulfeild's estate in Dublin in the 18th century. The Casino is itself an interpretation of Palladio's Villa Rotunda just outside Vicenza. Both historic buildings feature a plan in the form of a Greek cross, with four matching elevations. 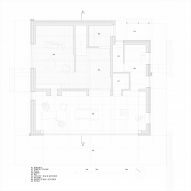 O'Brien was particularly interested in the internal arrangement of the Casino's service areas, which he adapted in order to create spaces suited to contemporary domestic life. 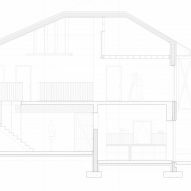 "It was the basement plan of the later villa that I became preoccupied by," he explained. 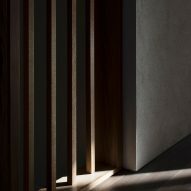 "The walls are pushed and pulled to facilitate the domestic programme of the downstairs servant staff, while still bearing the dominant order down from above." 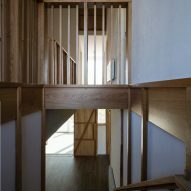 The square plan of Killan Farmhouse maintains visual axes through the building, but the positioning of the internal walls is manipulated to create the required spaces and accommodate recesses or alcoves for doors and benches. 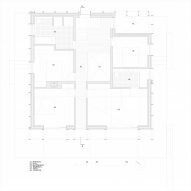 The predominantly open ground floor contains living areas arranged around a double-height hall. 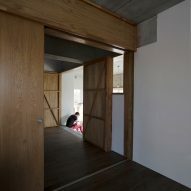 A step in section along the east-west axis separates the kitchen and dining areas from the hall and lounge. 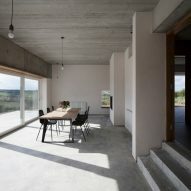 Panoramic windows lining the lower portion of the ground floor are spanned by a concrete beam which, along with further beams, supports the pre-cast concrete floor panels of the upper storeys. 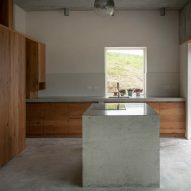 Floors and ceilings throughout the spaces are finished in exposed concrete, while the walls are plastered in an off-white sand cement. 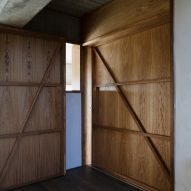 Oak used for flooring on the upper level and for joinery including the large sliding doors that can be used to partition spaces if required introduces some natural warmth and texture to the scheme. 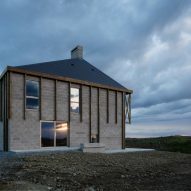 Unlike the historical precedents, Killan Farmhouse's square external form features four distinct elevations that give it a different character when viewed from various angles. 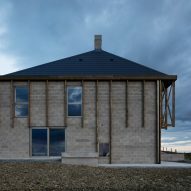 An offset chimney also results in an asymmetric pyramidal roof which contributes to its irregular appearance. The building's facades are formed of bare cement blocks that were specified in order to ensure the project adhered to its strict budget. 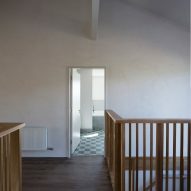 The intentionally rough-and-ready aesthetic lends the house a unique and ambiguous character. 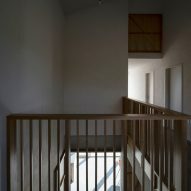 "The house is deliberately unharmonious," O'Brien added. "If it appears half finished, it is so that it remains open to multiple interpretations." Vertical timber fins wrapping around all sides support a chunky Douglas-fir box gutter. At the northeast corner, cross-braced wooden elements form a portico marking the entrance. 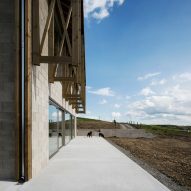 Similar frames support an extension to the eaves on the southern elevation, which helps to shade the large glazed opening and the patio outside. The building is surrounded by concrete paths incorporating steps and ramps. 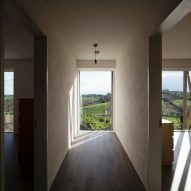 These walkways are enclosed by cast-concrete benches and walls that complement the house's robust design. 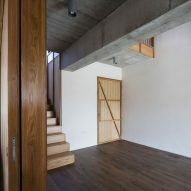 Other architecture projects that celebrate their raw materials and structure include the headquarters of British furniture brand Vitsœ, which features an exposed cross-laminated-timber framework, and a low-budget apartment building in London featuring exposed plaster walls and off-the-shelf materials. Photography is by Aisling McCoy.